From the Late 18th Century, the Staffordshire Potters were successful in creating and developing a mass market for pottery figures, at prices affordable by the then burgeoning working class. 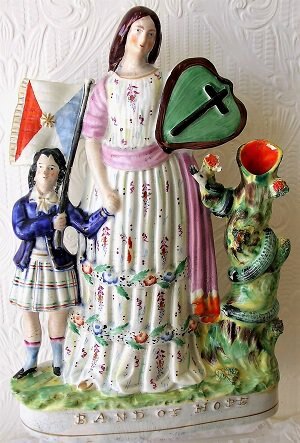 These, in the form of animals, buildings and popular figures of the day adorned the homes of those who could not dream of aspiring to ownership of the fine porcelain products indulged in by their wealthier neighbours. Soon, in cottages and farmhouses throughout the land, chimney mantels were rarely to be found without their complement of “Comforters” as pairs of spaniels were known and, in an age when few workers were so fortunate as to possess a watch or clock, a pottery model of a church or mansion complete with it’s simulated timepiece did the trick admirably. The industry likewise played it’s part in stimulating and promoting that keen sense of national pride and loyalty to Crown, Country and Empire that was such a feature of British society throughout the 19th Century. Thus, along with the animals and buildings came a veritable tide of models of members of the Royal Family and other notable personages, theatrical, military and historical, all of these conspiring, if only subliminally, to cement and support the status quo. Today, these Staffordshire Figures are collected and valued as pleasing examples of indigenous English Folk Art, and as gentle reminders of an age now long passed. We commend them for their simple if naïve beauty, and for allowing us, as we admire them, a glimpse into their now vanished world.